For all of my grown-up years, I've had this belief that less is more. 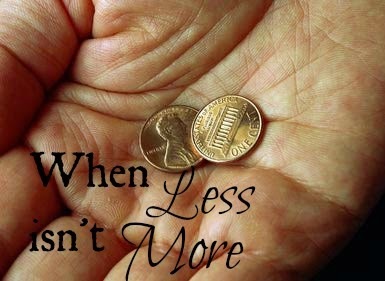 To be more specific... that those who have less love Jesus more. That's what I have believed somewhere in the deep recesses of my soul. It's a novel idea to believe that, right? I mean, it's certainly hard to believe badly about a person who gives up their stuff or who has little. It's certainly harder to give up than it is to accumulate. And just look at all the verses in the Bible about those who are wealthy in this world and how detrimental riches are. Those scare me, ya'll. They leave me constantly crying to God to not let me be consumed or content with my money. The Bible talks a lot about money! Randy Alcorn says that "15 percent of everything Christ said related to this topic- more than his teachings on heaven and hell combined." So for many years of my life, it has seemed right and easy to believe that having less is more godly. And this belief has led me in life decisions and caused me to judge others. But lately God is doing things in my heart and leading me in ways that feel very scary. Because they aren't "less." They are more. And this long-seated belief of "less is more" keeps screaming at me to just sell everything and to go live in a little shack because God will be most pleased with me there. But this isn't the Holy Spirit speaking to me. It's my pride. And that's when less isn't more. Less isn't more when we do it out of pride. Pride says less is more because others will believe I'm more godly if I give up my stuff and I live in a shack. Or in a jungle. The focus is all on me. I make my decisions ultimately because of myself and not because of God. Pride says less is more because it seems easier to start out with less than to have more and for God to take it from me. Pride says less is more because to whom much is given, much is expected... and that means I may have to work very hard for money that I am expected (by God) to hold loosely and give away freely. I don't have all of the answers in this area, still. And that is why every day I still fight against this battle inside of me as I make daily choices, and that is why every day I cry out to God to stop me in my tracks if I am chasing after wealth. Or if I'm chasing after pride. There's this rich man that Jesus tells a story about in Luke 12. This man had barns and lots of crop. And he had so many crops that he decided to tear down his barns to build bigger ones. And this is how Jesus responds: "You fool! You will die this very night. Then who will get everything you worked for?" And the verse continues with narration and says, "Yes, a person is a fool to store up earthly wealth but not have a rich relationship with God." So riches do matter. Being rich is dangerous. Accumulating wealth is not a small thing in God's eyes. BUT we are not measured in God's eyes by the amount of money we have or don't have. Christ's blood alone is what saves us, and God looks at our hearts. Our hearts are what show our love for the Lord. Not our amount of money. And I do believe that often we will be asked to give up wealth and treasures as a result of our love for the Lord. But this looks different for everyone. God calls each of us differently. And I don't get it. But I don't have to understand it. As long as my heart is open to God calling me to give up what he has given to me, then I know I am in step with Him. And whatever my lot, I don't have to be afraid. I must remember that God is always working for my good! Always! So if he gives me stuff, it's for my good. If he takes stuff, it's for my good. This I do know: In Matthew 6, Jesus says, "Don't store up treasures here on earth, where moths eat them and rust destroys them, and where thieves break in and steal. Store your treasures in heaven, where moths and rust cannot destroy, and thieves do not break in and steal. Wherever your treasure is, there the desires of your heart will be also." If Jesus is my treasure, my desires will be in line with him. So if he gives me money and stuff, then I can trust that he will show me how to use it for his kingdom purposes. If he takes my money and stuff, I can trust that he will provide for my every need. Thanks for your kind words, Kelly. Honestly, I'm not sure what I expect to make out of this blog at this point... but I needed a place to write my thoughts as God is teaching me so much right now and I'm so thankful! And we're doing a house renovation at the same time, so it's fun to share that with friends and others! I just checked out your blog and love that you share your faith on it :) It's so wonderful that God can give us a passion for so many things and allows us to love them and pursue them... but you're right when you say that at the end of the day, Christ is all that matters. He SO is! Always love reading your heart. Your vulnerability is encouraging and so many people know exactly what you're talking about. I struggle with those things too. :). And, like you, God has taken me/is taking me on a path to grow me in my understanding and to trust Him and Him alone with money. Rock on sister.